PENSACOLA, Fla., Aug. 23, 2016 – Petty’s Garage, the ultimate high performance speed shop, will unveil their “80th Birthday Tribute Car”, during Mustang Club of America’s celebration on Saturday, Sept. 3 at 9:30 a.m. Hand-built by some of the top NASCAR designers in the industry, the limited edition Mustang honors Richard Petty’s 80th birthday and is based on America’s best-selling sports car, the 2015-16 Ford Mustang GT. Saturday morning, Richard Petty and Petty’s Garage will unveil the “80th Birthday Tribute Car” at the historic Indianapolis Motor Speedway. In addition to the presentation and unveil, Petty’s Garage along with members of the Petty Family will present “The King” of NASCAR with the #43 Mustang; the last car in the limited-edition series. Other exclusive features include a unique racing livery and replica paint scheme from the 1996 25th Anniversary #43 car driven by Bobby Hamilton. Additional upgrades include a custom leather interior, a NASCAR inspired rear-wing, distinctive front grille and body panels and exclusive numbered badging throughout. After the unveil and presentation of Petty’s Garage’s latest Mustang, guests are encouraged to join the Petty’s Garage team and “The King” of NASCAR for a brief photo and autograph session at the Petty’s Garage trailer on Saturday. For more information about the latest Mustang to grace the stables of Petty’s Garage, visit http://pettys-garage.com/. As details continue to be finalized for the event, please check for more information at the event-specific website, http://www.mca40th.com/ and at the MCA website, http://www.mustang.org/. 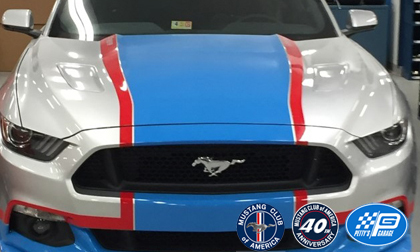 The Mustang Club of America is a nonprofit organization dedicated to the preservation, care, history and enjoyment of all model years of Mustang, Shelby, Boss, Saleen, Roush, SVT Cobra, Steeda and McLaren. Membership includes enthusiasts throughout the United States, Canada and worldwide, and more than 190 regional clubs. For more information, visit http://www.mustang.org/.